The first edition of this popular guide provided a path between SAS and R using an easy-to-understand, dictionary-like approach. Retaining the same accessible format, SAS and R: Data Management, Statistical Analysis, and Graphics, Second Edition explains how to easily perform an analytical task in both SAS and R, without having to navigate through the extensive, idiosyncratic, and sometimes unwieldy software documentation. The book covers many common tasks, such as data management, descriptive summaries, inferential procedures, regression analysis, and graphics, along with more complex applications. This edition now covers RStudio, a powerful and easy-to-use interface for R. It incorporates a number of additional topics, including using application program interfaces (APIs), accessing data through database management systems, using reproducible analysis tools, and statistical analysis with Markov chain Monte Carlo (MCMC) methods and finite mixture models. It also includes extended examples of simulations and many new examples. Through the extensive indexing and cross-referencing, users can directly find and implement the material they need. SAS users can look up tasks in the SAS index and then find the associated R code while R users can benefit from the R index in a similar manner. Numerous example analyses demonstrate the code in action and facilitate further exploration. The datasets and code are available for download on the book’s website. Further Resources and Examples appear at the end of most chapters. "This book is not only an excellent cross-reference for SAS or R users to find the corresponding code in the opposing language, but also a useful resource for readers to learn statistical programming in both systems. The book is organized into 12 chapters covering a wide range of programming and statistical topics, with both SAS and R code presented for all tasks. … This book is a great resource for users who have a long experience in only one system and need to use the other system. The SAS index at the end of the book is particularly of help for SAS users to look up a task for which they know the SAS code and turn to a page with that SAS code as well as the associated R code. And the R index in the book is used the same way by R users to find the corresponding SAS code for a task." 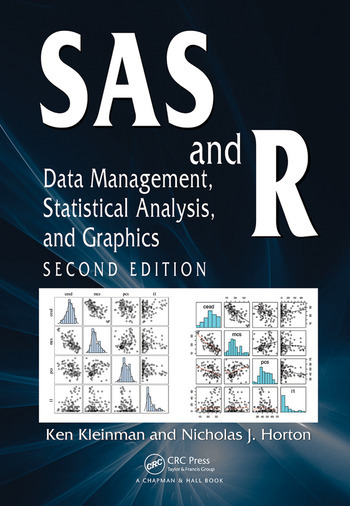 "The second edition of SAS and R: Data Management, Statistical Analysis, and Graphics has several updates from the first, most notably the addition of three new sections, and the inclusion of R-Studio, which is a more user-friendly version of R. The first new section covers simulating data, the second covers several special topics, such as Bayesian methods and bootstrapping, and the third explores some case studies… This book is not intended to be read cover to cover, but rather as a dictionary of how to do things in both SAS and R. It covers a wide range of topics, including data management, numerical and graphical descriptive summaries, common statistical procedures, regression analyses, and regression generalizations… If you know either SAS or R, but not both, and are looking for a quick reference for common statistical tasks to be performed in the language that you are not familiar with, you will find this book helpful." "This book provides a very useful bridge between the two packages … . A wide range of procedures are covered and the code, which is generally well explained, is available for download from their website. … this is a very useful book for SAS and R users alike with an excellent overview of a wide range of data management options, statistical analyses and graphics. … full of useful tips and tricks." "It is clearly written and code is appropriately highlighted to facilitate readability. … it is a potentially useful reference material for experienced users of one of the two systems, who need to quickly find how to perform a familiar task in the alternative system." "It is an excellent text that is designed to translate SAS to R. … For statisticians with knowledge of both SAS and R programming, this book provides a useful resource to understand the differences between SAS and R codes and can be used for browsing and for finding particular SAS and R functions to perform common tasks. The book will strengthen the analytical abilities of relatively new users of either system by providing them with a concise reference manual and annotated examples executed in both packages. Professional analysts as well as statisticians, epidemiologists and others who are engaged in research or data analysis will find this book very useful. The book is comprehensive and covers an extensive list of statistical techniques from data management to graphics procedures, cross-referencing, indexing and good worked examples in SAS and R at the end of each chapter." "As the authors point out in the Introduction, the book functions like an English–French dictionary. The material is organized by task. By looking up a particular task you wish to perform, R and SAS code are presented and briefly explained. … It is easy to find the section in the text which gives several ways to do this in both SAS and R. … Because the authors often present alternative ways to do a task, this book can be a great source of diverse and elegant solutions even to experienced users. Each task is cross-referenced to other tasks. … The book has a comprehensive website containing the code, datasets, a FAQ, blog, and errata list with a link to report new errors. … The end of the book is very useful, where there are good introductions to SAS and R, as well as separate subject, SAS, and R indices. These indices are invaluable for finding a topic when you are unsure of exactly how to phrase it. … there is great breadth and scope of the material in this book. … If you use both SAS and R on a regular basis, get this book. If you know one of the packages and are learning the other … get this book, too." "… a convenient reference text to quickly learn by example how to perform common tasks in both software packages. … the book provides a powerful starting point to a wide variety of statistical techniques available in SAS and R. … it facilitates a translation between SAS and R, without getting overly detailed or technical. It is mainly useful as a starting point for those who already know either R or SAS, and want to learn the other language, without going over extensive manuals or introductory texts."